Your BMI, or Body Mass Index is a representation of your body fat from an equation using your height and weight. The following table will represent your classification. What is wrong with Body Mass Index? It does not take into account your muscle mass. Muscle mass is important consideration for the equation because muscle is denser than fat, i.e.1kg in muscle is the same as 1 kg in fat. However, 1kg of muscle takes up less space than 1kg of muscle. For these reasons, people who are more muscular can and will be classified as obese. Imagine 10kg of feathers and 10kg of bricks, which one will take up the least amount of space (but weigh the same!)? Carrying additional muscle is more beneficial than carrying around additional fat. If the BMI is a poor indicator what other simple method could I use? As BMI does not take into account muscle mass, a suggested alternative is the Waist to Hip ratio. This divides the measurement from your waist by the measurement of your hips. Men and women have slightly different scores when it comes to an adequate measurement. Why is excess body fat an issue? It is important to be within the “healthy score” on the BMI indicator and Waist to Hip ratio as you are more likely to have a better quality of life. The higher your BMI or Waist to Hip ratio, the lower your health-related quality of life will be: people with higher BMI (25 and above) have increased mortality rates. 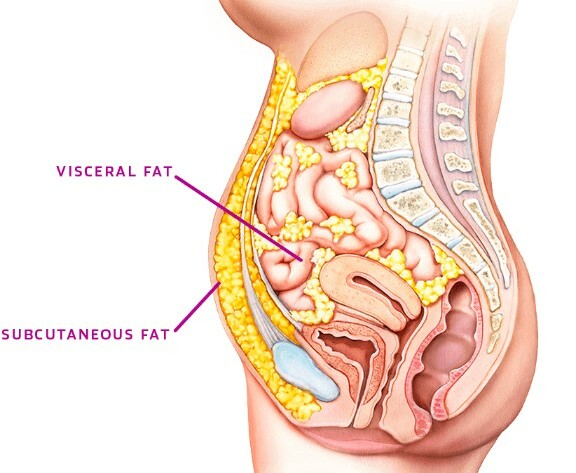 In the body we have two types of fat, subcutaneous and visceral. Subcutaneous fat is the fat we generally ‘see’, it is located just below the skin and is the fat we see and feel we need to get rid of when losing weight. The other is visceral fat. This is fat we can’t see, and is what we actually should be getting rid of, as this fat surrounds the organs. Using both your BMI and weight to hip ratio together will give you the best guide to if you ought to start making changes. Research shows that it is not only the amount of fat we have but where we store the fat. Those who store fat around the torso (giving a high hip to weight ratio) have higher mortality rates than those with the same BMI – even if it’s high – with a low hip to weight ratio. The study also reported that this impacted more on men more than women. This study shows that we should be all keeping an eye on our waist to hip ratio, as it is a really good indicator of health.